Gulls were eating more juvenile salmon than biologists realized, which meant fewer of the fish were making it to the ocean. There are a lot of predators known to eat imperiled salmon, from sea lions to double-crested cormorants. For a long time, biologists thought gulls weren't a big part of the problem. "When some analysis was done, the impact of gulls — just in the section from McNary (Dam) to Bonneville (Dam) — nearly 20 percent of the fish taken were taken by gulls," said Blaine Parker, an avian predation coordinator with the Columbia River Inter-Tribal Fish Commission in Portland, Ore.
At first, biologists searched for pit tags — which are used to track salmon — near where gulls nested on a series of rocks near the confluence of the Deschutes and Columbia rivers. In the spring, when fish are migrating out to sea, gulls are commonly seen flying from the rocks to river dams, Parker said. But biologists never found any whole pit tags, just broken ones. Then they realized gulls have a sort of crushing gizzard, like chickens, which was breaking the tags. Gulls were eating more juvenile salmon, which meant fewer were making it to the ocean. "At that point, the lights came on, and people thought, 'Wow, we have a problem here,'" Parker said. But, with all the other predators snapping up salmon, there hasn't been much attention paid to gulls, which are also believed to be eating juvenile Steelhead trout, Parker said. The area Parker is concerned about, Miller Island, has up to 6,000 gulls nesting there during spring salmon runs. "It's almost like an express line going up the river," he said. The solution he proposes? Lethal control of specific problem gulls, along with non-lethal harassment. The dams already have bird wire and occasional pyrotechnics to scare away avian predators, but it's not doing enough, Parker said. 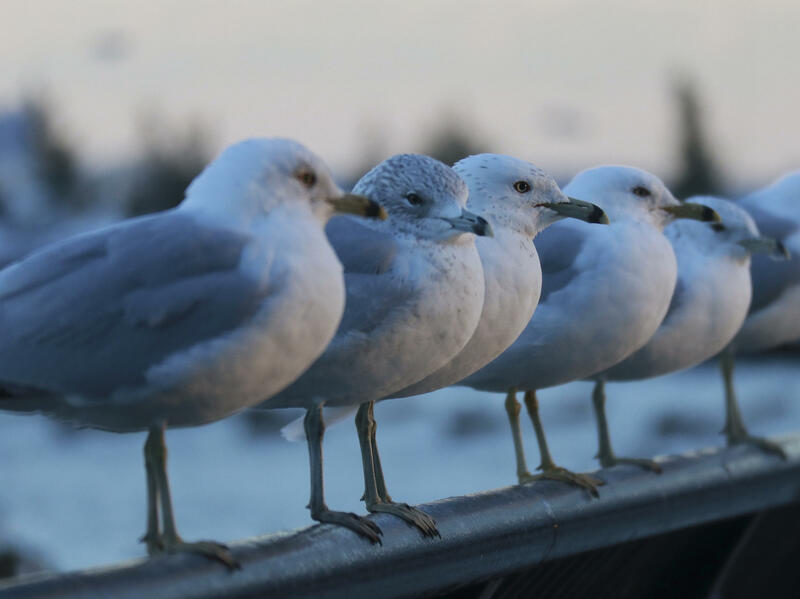 "Not all gulls are 'guilty' of eating salmon, but some of them are," Parker said. "And the ones that are routinely up in the tailrace [the channel that carries water away from the dam] eating salmon probably need better management. But just those gulls specifically." At the same time, Parker said some gulls can actually help salmon out. They're are opportunistic eaters. Besides scavenging trash and French fries lost on the ground, gulls will eat other birds' eggs. They've helped keep the number of Caspian terns at the troubled East Sand Island in check, Parker said. There, government officials have killed double-crested cormorants to increase juvenile salmons' chance of survival. Any killing of gulls — referred to as "lethal management" or "lethal control" by the government — is a tactic the Audubon Society of Portland vehemently opposes. "It's a continuation of a very unfortunate pattern of killing wildlife to protect other wildlife," said Bob Sallinger, conservation director at the society. It's not the wildlife that's the problem, Sallinger said, it's the dams. Killing gulls, he said, is "pure scapegoating." "The Army Corps of Engineers has refused to do what's necessary to modify those dams to protect salmon, and that is why salmon are continuing to decline. Killing wildlife is not going to change that situation." These birds are "simply doing what comes naturally," Sallinger said. Back in 2014, the federal government was authorized to take ring-billed gulls, California gulls and double-crested cormorants at five dams farther up the Columbia River. It was the first time in 20 years dam managers said they had to kill "nuisance birds." That program is still in place at five dams. But lethal take is always a last option, said Gina Baltrusch, a spokeswoman for the U.S. Army Corps. The same program could be put in place in problem areas on the Lower Columbia River, Parker said. Removing some of those birds wouldn't hurt the population overall, he said. "There's tens of thousands of gulls within the Columbia River Basin. There should be some deference given to fish and not to birds. It's really the other way around in a lot of cases." This story comes to us from Northwest Public Broadcasting. Copyright 2019 Northwest Public Broadcasting. To see more, visit Northwest Public Broadcasting.